It was October 24, 1914 when Morris Meredith Williams, a man of diminutive stature first attempted to join up. It wasn’t until April 1916 that the army finally allowed him to fight for his country, in the 1st Glamorgan Bantams. During a war spent in France’s trenches in areas on the Somme and elsewhere, he made maps from aerial reconnaissance shots and painted camouflage, later being kept back with a small group of artists to make paintings for official record. After the war the husband and wife team were commissioned to design many memorials round the country, the concept art and final product of which are shown in this volume. 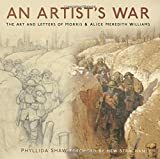 In this stunning book, the Meredith Williams’ art is displayed in fine style, ranging from the touching and heartfelt to the most brutal, stark images of the waste and loss of war.